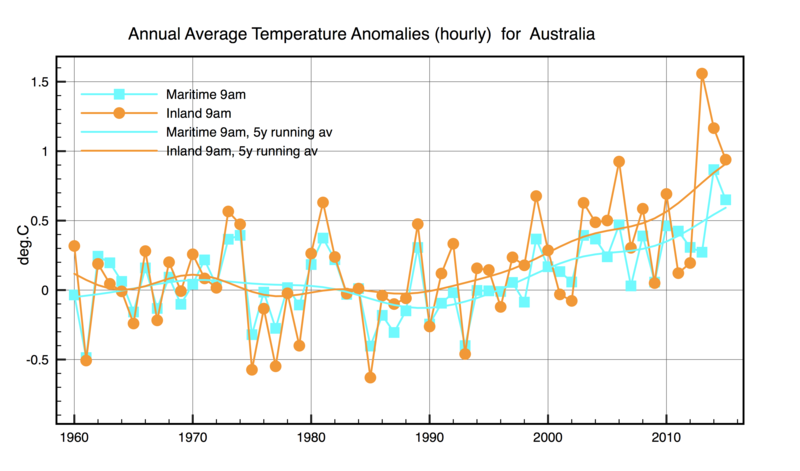 Warming in Australia occurs mostly inland and at night. The previous post showed that there are just two long term timings of temperature measurements at Australian weather stations – 9am and 3pm. I next divided the stations into inland and maritime, where maritime are those stations either located on the coast or on off-shore lighthouses. I then calculate the annual anomalies first based on measurements at 9am and then on measurements at 3pm. This is the result. 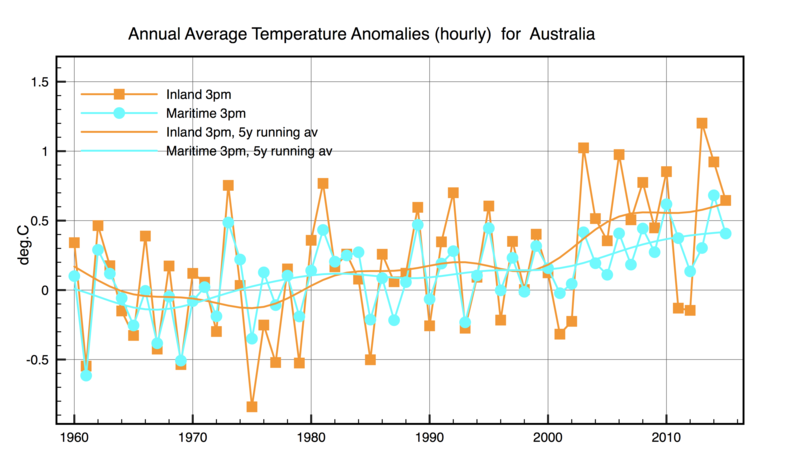 Warming after 1990 in Australia seems to be about 50% faster inland than on the coast. Furthermore warming predominantly occurs at night (9am enhancement of 30%). This entry was posted in AGW, Australia, Climate Change, climate science and tagged global warming. Bookmark the permalink. 14 Responses to Warming in Australia occurs mostly inland and at night. Why? Presumably hotter land sucking in oceanic air during the day and the increase in relative humidity holding the temperature higher and longer? Air temperature depends on where the air is coming from. In many Australian locations there is either a land or a sea breeze. In general the flow of the weather systems is west to east. However, in summer a tropical monsoonal flow can bring moist humid air to the centre and south. On the east coast the range of temperature is much greater reflecting the greater diurnal swings experienced inland. On the west coast where I live hot days come with an easterly wind while the west wind brings the cooling influence of the sea, The south wind can be bitterly cold while a wind from the north west heralds rain and warmer days. Wind flows from high to low pressure areas. The relativity between these zones changes over time and with it, air temperature.Where I live the relative absence of an east wind means a summer with moderate daily maximum temperatures. We are having one of these this year. The gold standard of analysis considers temperature by the hour. In general we lose the ability to discern trends and work out what is going on as soon as we start aggregating and averaging. Consider this: The sum of the minimum and the maximum daily temperature divided by two can be two or more degrees wither side of a true average of 24 daily readings varying with location. If you are going to look at the Acorn stations that have heavily adjusted data then you should compare with the raw data from individual stations to see the effect of the adjustment. Clive, how many station of each group did you use and how far inland were the second group ones? Earl, how many kilometers are you from the coast and how far inland before the marine effect becomes negligible? Ron, There are 59 maritime stations and 50 inland stations. I rejected 3 stations because they are so far away – Antarctica etc. I am 6km from the coast. The penetration of the sea breeze is dependent on the location of the pressure centres and the extent of heating of the land mass., The.degree of cloud cover during the day is likely to be a factor.in the heating of the land mass. Along the south coast the sea breeze arrives earlier, 100km inland later in the day. Along the south coast the sea breeze and the ‘prevailing wind’ which is a south east trade are one and the same thing. Erl, are there any studies you are aware of that quantify the degree of marine influence penetration or conversely land influence on SST near coast lines? Thanks for the link. I am very interested in this and at somewhat surprised I can’t find any other systematic quantitative studies. Cheers, and congrats for the nice blog. A frequent writer at WUWT explains clouds forming during the day reflecting sunlight. This would mitigate gain. This would not occur at night. So days would be more resistant to gains while nights would not be. Warming at night is what you’d expect from additional ‘Green House Gases’ which prevent temperatures plummetting to zero when the sun is no longer shining. My investigations into England temperatures shows minimum night-time temperatures higher than average with maximum daytime temps the same as average. Greenhouse Gases were postulated to explain why temperatures don’t plummet to zero when the sun isn’t shining. Thus you’d expect the additional CO2 to make night-time minimum temperatures lower. I have found this for England while maximum daily remain the same as century average.